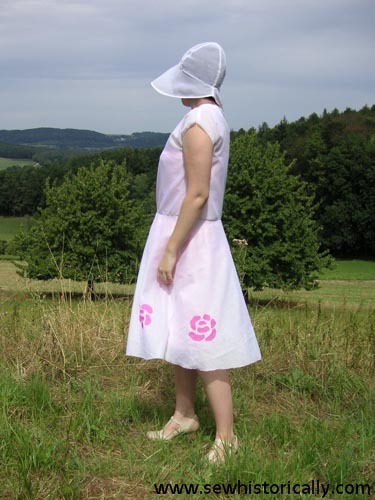 This is my sheer 1920s chiffon dress with appliqued pink roses. 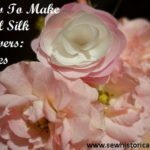 I followed these 1920s sewing instructions for the rose appliques. But instead of chiffon velvet on chiffon, I used georgette on chiffon. At first I feared the chiffon would distort terribly while appliqueing the roses but it went better than expected. Instead of basting the georgette to the dress – as the 1920s instructions recommend – I just pinned the georgette rectangle to the chiffon. 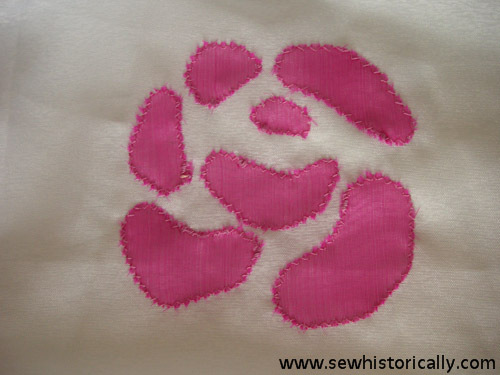 Then I stitched the rose petals freehand roughly like the roses of the 1920s dress. This way all my roses look a bit different – but I like it because it looks so natural. I zigzaged round each rose petal before I cut the georgette away. 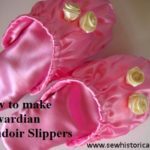 Appliques in the 1920s were often done with a tiny zigzag stitch as here. After washing the dress, the edges frayed a bit but the applique is still securely attached. As the dress is sheer, it can be worn with different colored slips. Here I’m wearing it with a mint green slip. In the pictures above I’m wearing a pink satin slip underneath. And here I’m wearing it with an apple-green slip. The light isn’t perfect to show the colors of the slips: Usually, the colors show through more than in these pictures. I’m also wearing my 1920s chiffon cloche hat. 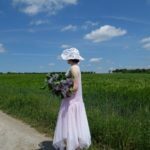 Here you’ll find my tutorial for a 1920s imitation picot hem which I used to finish the hem of this dress. Congratulations, Lina! Your dress turned out lovely. I love the choice of deep pink roses for your appliques. And I am so impressed that you used georgette and chiffon. I can see the green and the pink of the slips peeking through in your pictures – it’s subtle, but definitely the colors do show. How fun to use different colored slips. 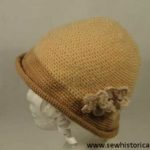 Love the cloche too!